Ground below Antarctica found to be rising rapidly- What happens next? Scientists have now found that the Antarctic bedrock is rising up by about 41 mm every year because of the thinning ice above it. There is solid ground below the Antarctic continent and it is rising fast, lifting the ice sheets seated on it in the process. Scientists have now found that the Antarctic bedrock is rising up by about 41 mm every year and it could be because of the thinning ice. Ice in Antarctica is seated on a massive landmass that has its own geological features, but the sheets on it extend to many thousands of meters on top of it, making it the largest reserve of freshwater in the planet. All that ice is heavy, resulting in much pressure and weight being placed on the landmass. It means, the ground was actually pressed down into the Earth. As ice melts and begins to thin out over time, scientists have come to realise that pressure on the bedrock is slowly letting up, and the semi-solid nature of the mantle is pushing the crust upward, much like a coiled, compressed spring. The study was carried out by a team of scientists led by Valentina R. Barletta who found this phenomenon taking place near the coast of the Amundsen sea. While collecting data, including GPS readings, the team found the viscosity — thick, sticky, and semi-fluid in consistency — of the mantle under the West Antarctic Ice Sheet was much lower than expected. There is a bit of good news with this finding, say the researchers. While this ice loss is no way a good sign, the lifting up of the remaining ice left on the land will get more stable and not slide so easily into waters. Considering how the walls of ice in Antarctica are getting calved out because of the lashing ocean waves, more stability could come to the ice shelves because of this lifting. The bad news is that because of this lifting up of the ice sheet, satellite measurements are vastly off, and ice loss is likely to be underestimated. In some cases by up to 10 percent, says the report. Antarctica has almost all the solid permanent ice in the world- about 90 percent of it. 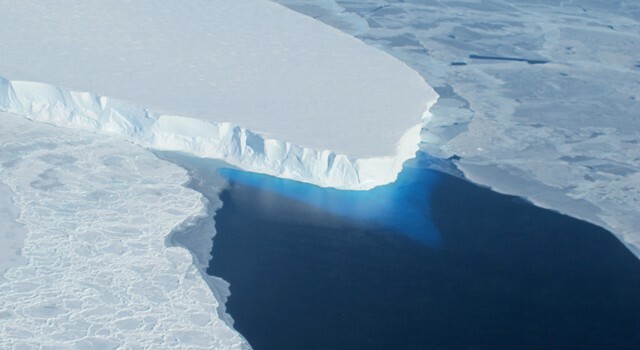 If this all falls into the sea and melts, the world's sea level will rise by about 61 metres. What is worrying, about the sheer speed of the rebound which is about— 41 mm per year— was "one of the fastest rates ever recorded in glaciated areas," study co-author Abbas Khan, an associate professor at DTU Space, said in a statement to LiveScience. The study was first published in the journal Science.